FORT BRAGG, N.C. -- On March 10, 1865, Confederate cavalry overran an unguarded Union encampment that was located in what is now western Fort Bragg. "The battle probably wouldn't have even happened, had not the Union failed to implement a basic task of soldiering," said Maj. Brian Hoffman, operations officer for a battalion of combat enablers in the 82nd Airborne Division. When the sequestration budget cuts forced Hoffman to revisit an officer-development "staff ride" planned for the Civil War battlefield at Fredericksburg, Va., he asked his planners to look closer to home. That's when they discovered a little-known skirmish called the Battle of Monroe's Crossroads, which occurred just south of what is today Fort Bragg's Normandy Drop Zone. Monroe's Crossroads was ideal for more than its location and low cost, said Hoffman, who has participated in five staff rides over his 15-year career. For one, there was peer-reviewed literature and a well-researched book, "The Battle of Monroe's Crossroads," by Eric Wittenberg, to use as source material, said Hoffman, a Citadel graduate who also holds two master's degrees. Finally, and most importantly, his officers could walk the battlefield site. "You can't get the real value of a staff ride unless you can walk the terrain," said Hoffman. In late March after doing their homework, lieutenants and captains with 1st Brigade Special Troops Battalion, 1st Brigade Combat Team, did just that. During the staff ride, each officer was assigned a historic figure, a tenet of unified land operations, or a warfighting function to follow through the battle. 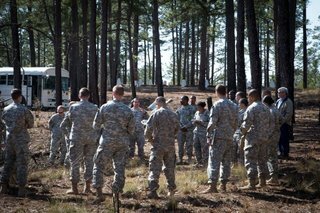 As the group walked the battlefield, they stopped at important points to discuss their assigned roles. "It was a really good thing," said intelligence officer, Chief Warrant 2 Charles Lowry. "I've been here 10 years, and that was my first staff ride. You could see where they had their failings in intelligence. It was a definite example of why intelligence is critical to mission success." Cpt. Stephen Brooks, an operations planner who has a degree in and a passion for history, said that, for him, being able to visualize actions on the battlefield made all the difference. "The technology [of warfare] changes, but a lot of the issues -- the friction you find on the battlefield -- is often the same," he said. Brooks noted that, after capitalizing on a Union failure to emplace pickets for security, the Confederates lost the initiative through poor communication and lack of discipline. That allowed the Union to muster a counterattack, but the delay caused by the initial attack allowed Confederate infantry to cross the Cape Fear River and burn the bridges behind them, further delaying the Civil War in the Carolinas by several weeks. One of Hoffman's goals for the staff ride was for officers to learn that what they got out of the event depended on what they put into it. For Brooks, that was perhaps a full day's work spread over several days. Hoffman also wanted junior officers to learn to be less nostalgic of past armies and battles, he said. "Whether you look at the Civil War, the Vietnam War, or even World War II, decisions were made and actions were tolerated that we wouldn't accept today," Hoffman said. What can we pull forward and use today? he asked them. Before the Army became involved in two lengthy wars, it was common for officers to employ several semi-formal means of officer development, including the airborne community's rite-of-passage known as a "prop blast," officer social calls, and staff rides, he said. "Many junior leaders don't know how to be a garrison army, but they are very good at problem solving," said Hoffman. "We need to embrace those skills and be patient while they learn." Lowry believed that Hoffman achieved his goals with the staff ride. "We built some esprit de corps and learned some military history," he said. "No matter how complex out jobs get, you can see how it applied 150 years ago. When we wear 120 pounds of gear going on an objective, knowledge of the terrain is absolutely imperative, just as the Confederate cavalry didn't appreciate the terrain impact of mud in the Battle of Monroe's Crossroads. Hoffman, who has nearly a dozen deployments with both special operations and conventional forces, said that he hoped other Bragg units would take advantage of the work that the battalion staff did on the Monroe Crossroads Staff Ride. All of the operational orders required of a unit to execute the staff ride have been developed and refined, he said. Hoffman's unit opted to build an entire day around the staff ride, including morning physical training at a downtown Fayetteville climbing gym to build team spirit, and lunch at a nearby restaurant while Heath, the anthropologist, presented a battle overview, he said.